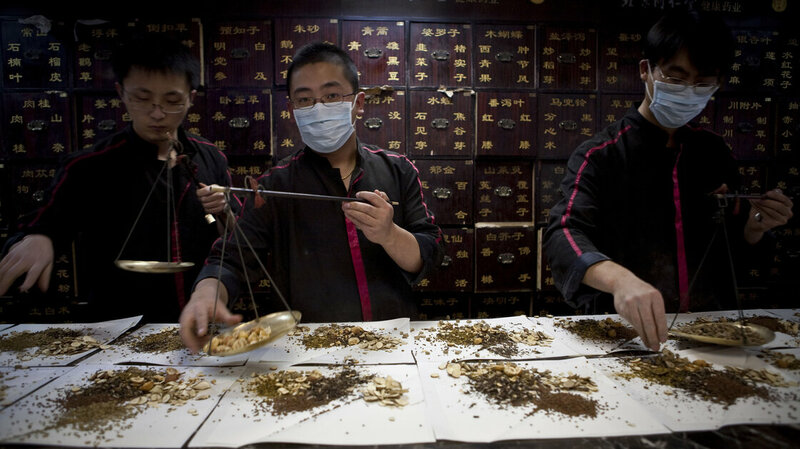 Workers prepare Chinese traditional medicine for customers in Beijing. The treatment uses arsenic trioxide, which has traditionally been used in Chinese medicine. The U.S. Food and Drug Administration approved arsenic trioxide (sold as Trisenox here) asa treatment in 2000, and later research showed that patients who received standard chemotherapy followed by arsenic trioxide did better than patients who just received standard chemotherapy. The arsenic trioxide treatment was developed by a Chinese doctor working in northern China during the Cultural Revolution, according to Mount Sinai’s Waxman. This doctor couldn’t use much Western medicine, so to treat his APL patients, he started giving them arsenic trioxide intravenously. He kept a journal for 10 years and noticed that it worked remarkably well. Heeventually published his findings in 2001 with other collaborators. Other researchers are also studying triptolide, a natural product of a traditional Chinese medicinal plant called lei gong teng or “thunder god vine” as a possible anti-cancer drug. The product was effective against cancer in animal models and scientists in the West are now studying exactly how it works, says Jun Liu, one of the researchers and a professor of pharmacology and molecular sciences at Johns Hopkins University. Research into Chinese medicine is no different. Cancer reseachers at the University of Minnesota recently started an early clinical trial to study a drug that was developed from triptolide for treating pancreatic cancer, says Edward Greeno, associate professor of medicine at the University of Minnesota. He points out it took millions of dollars just to get to this point. Studying Chinese medicine for new treatments has had its share of wrong turns. Western scientists previously looked into treatments for the prevention of dementia, eczema, andbacteria that cause most types of stomach ulcers, but concluded they weren’t particularly effective. But the failures don’t mean we should give up, says Brian Berman, a professor of medicine at the University of Maryland who served as the principal investigator of two Chinese medicine research initiatives funded by the National Institutes of Health.